Skunk Cabbage, Symplocarpus foetidus, is quite noticeable this time of year as its enormous leaves dominate the wetlands. Go driving around the countryside and where there are creeks, backwaters, or the edges of rivers in woodlands look for the very large, bright green leaves of this perennial plant. 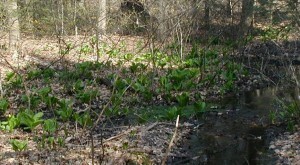 Patch of skunk cabbage near a drainage creek at Little Buffalo State Park. 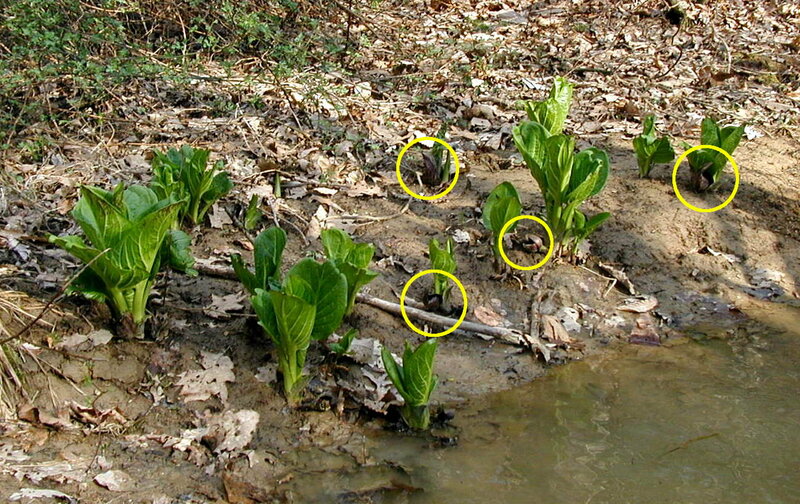 Close-up image of skunk cabbage plants in a wetland area. The flower of skunk cabbage is a strange one. It is the earliest flowering plant of the season by coming up as early as February. Actually, several very small flowers are grouped together in a special structure. Pollinated by flies, these posies stink like rotting flesh some say, but I don’t have any experience to make that comparison. Let’s just say, skunk cabbage has an appropriate name! Skunk cabbage flowers appear to be miniature yellow fringes dotted on a ball which is housed safely inside a leathery sheath. The sheath is referred to as the spathe and the ball of flowers inside the spathe is called the spadix. As the flowers become pollinated and the growth activity of the plant continues, the temperature inside the spathe becomes warmer than the ambient temperature. 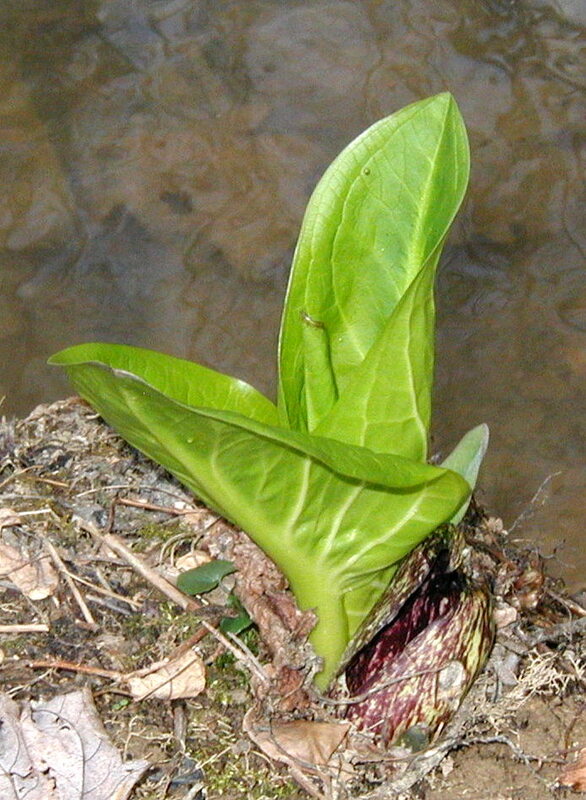 It gets so warm in fact that skunk cabbage flowers have been observed to melt snow from around the plant. Skunk cabbage leaves and flower next to a creek. The spathe in the image above – at the lower right of the plant – shows the typical mottled colors of maroon, brown, yellow and light green. The spadix cannot be seen through the opening of the spathe in the image above, but the tiny flowers are visible (in person) if you inspect inside the spathe. Flowers are barely noticeable at the base of the skunk cabbage leaves. 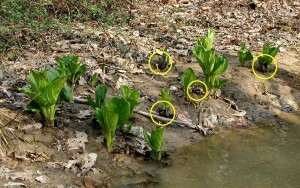 The skunk cabbage plants in this creek-side group are large enough or old enough to have flowered. Note that the yellow-circled areas mark the flowers at the base of the leaves. 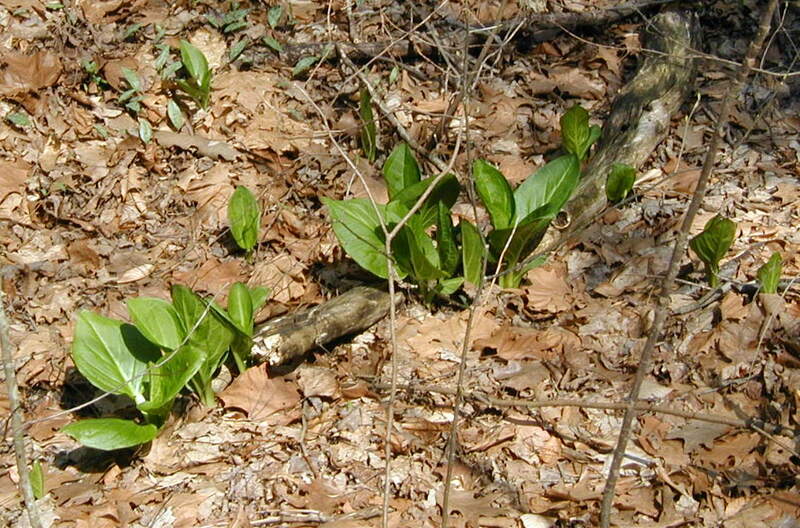 Leaves of skunk cabbage rise out of the ground all rolled together and rise up vertically as they emerge from the ground. Skunk cabbage leaves emerge rolled up and unfurl into huge oval shapes. As the leaves get bigger and bigger they open up more and more. Skunk cabbage leaves are enormous as they can grow 1 – 3 feet long and half as wide. Crushing a leaf releases the same rotten odor that the flower gives off. Nobody wants to eat this cabbage! However, Peterson’s Edible Wild Plants Guide tells us that the thoroughly dried leaves collected in very early spring can be used as a cooked green or reconstituted in soup. CAUTION – If the leaves are not dried well, calcium oxalate crystals – which are removed only by drying completely – will burn and cause inflammation. In fall the roots can be collected and dried completely to make a flour.